For the first time, funds of this scale have been assigned to the solar sector in any country, said Anurag Mundra, Joint Managing Director and Chief Financial Officer of Ujaas Energy. A day after the World Bank committed USD 1 billion to support India's solar energy projects, the industry is upbeat about the future of the country's solar energy sector. The World Bank-supported projects include solar rooftop technology, infrastructure for solar parks, bringing innovative solar and hybrid technologies to market and transmission lines for solar-rich states. The cumulative investment in solar would be the World Bank’s largest financing in this sector for any country. For the first time, funds of this scale have been assigned to the solar sector in any country, said Anurag Mundra, Joint Managing Director and Chief Financial Officer of Ujaas Energy — a solar power solutions provider. 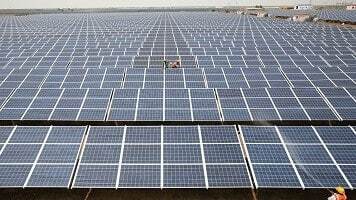 With plants producing a total of 8,000-12,000 MW coming up in the country, the World Bank's financing augurs well for the solar sector, he told CNBC-TV18. Some part of the financing will be soft loans and as part of this the World Bank will assign USD 625 million to State Bank of India, he said, adding that though Ujaas doesn't borrow its partners will benefit from such loans. Below is the verbatim transcript of Anurag Mundra’s interview to CNBC-TV18's Nigel D'Souza and Reema Tendulkar. Nigel: We got some news coming in that the power minister said that they have signed a pact with World Bank for loans of close to around Rs 4,000 crore or thereabouts and these loans will come in at low interest rates. Does the sector require these kinds of loans? What kind of difference can it make to the sector, can it spur more kind of aggression coming in? Could you tell us what is your analysis? Rs 4,000 crore is enough? A: Yesterday the World Bank has announced that they will be giving USD 1 billion to India for its solar project and it will cover mainly four sectors. One definitely rooftop, second infra for solar park, third development of hybrid technology including solar and fourth transmission line for the solar rich states. This is for the first time any agency has given a loan for the complete paraphernalia of the solar sector. Earlier last month World Bank has announced almost USD 625 million for the rooftop projects for Indian solar which includes USD 120 million by climate investment fund at a very concessional rate and USD 5 million grant by climate investment fund again. Now, these loans are typically of very long maturity. This climate investment fund loan has a maturity of 40 years and World Bank loan has a maturity of 20 years. Now, whatever the developments been happening it is very proactive and very positive for the country, slowly, gradually but continuously all the pieces of solar puzzle is falling in the place. Already KFW Germany has given 1 billion euro dollar loan for India, USD 625 million by World Bank and yesterday USD 1 billion by World Bank. Today Solar Energy Corporation of India Limited\\'s (SECI) bidding process is going for rooftop for 500 megawatt and I understand 1,000 megawatt of another tender is in pipeline. This year alone almost 8-12 gigawatt that is 8,000-12,000 megawatt of solar power plants are going to come up in country which means an investment of more than USD 1 billion in both equity and debt capital is going to happen in solar sector. So, as all the facts figures and developments are saying that solar has a bright future and whatever the development is happening is very encouraging. We at Ujaas, you must be aware, we are the first company to have a solar park and have a leadership position in rooftop. We are very encouraged by these proactive steps taken by the government and various multilateral funding agencies. Reema: So, how does this change financials for you? Will you be availing of the World Bank loan, and if yes, to what extent? All these make good headlines, but tell us for the company's financials how does it change? A: Yes, some of these loans are soft loans and come with a concessional rate. Like USD 625 million loan of World Bank is coming through State Bank of India (SBI). So, they do not provide loan directly to any company, they provide through one particular agency. So, for USD 625 million they have selected SBI. Similarly 1 billion euro loan by KFW Germany is coming through Indian Renewable Energy Development Agency (IREDA). Ujaas work in an asset light model. So, we do not borrow, we do not put projects on our balance sheet. But our customers who put up those projects they have been benefitted by this type of favourable terms. So, more solar projects will come in. So, Ujaas will be able to deliver more projects to our client at better terms and conditions. One more thing I wish to highlight, yesterday an agreement is signed between International Solar Alliance (ISA) where India is the leader those 121 countries which falls between Tropic of Capricorn to Tropic of Cancer are part of ISA and World Bank has committed that they will find out investment opportunity of more than USD 1 trillion by 2030. Now it is one of the very significant statement to say that okay, we are looking for this. As a company many times we pursue projects in other countries. However some of our competitors probably in the western worlds come with a better financial proposal. So, Indian companies take a beating on that front, but when this type of statements are coming it means that the government wants to take a leadership position, India wants to be a leader, not only in Asia but the complete ISA.